Now let’s consider the structure of deoxyribonucleic acid (DNA). The building blocks of DNA are nucleotides, which are made up of three parts: a deoxyribose (5-carbon sugar), a phosphate group, and a nitrogenous base (Figure 9.3). There are four types of nitrogenous bases in DNA: adenine (A), guanine (G), cytosine (C), and thymine (T). The phosphate group of one nucleotide is connected to the sugar molecule of the next nucleotide with a very strong connection: a covalent bond. Each nucleotide is joined to the next nucleotide in the chain by these strong bonds, forming a long chain of nucleotides that are very difficult to break apart. Watson and Crick proposed that the DNA is made up of two strands that are wound around each other to form a twisted ladder structure, called a double helix. 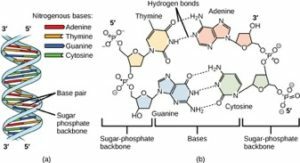 Base-pairing takes place between specific pairs of bases: A pairs with T, and G pairs with C. In other words, adenine and thymine are complementary base pairs, and cytosine and guanine are also complementary base pairs. The two nitrogenous bases that make up a complementary base pair are attached together with a weak chemical connection: a hydrogen bond. The locations of the strong covalent bonds and weak hydrogen bonds in a DNA double helix are very important. DNA is fairly easy to “unzip”, separating complementary base pairs (Figure 3). However, it is difficult to break apart the chain of nucleotides. This means that the order of the bases in the DNA molecule can be permanently maintained.